Heya! 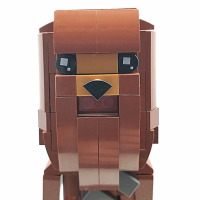 I have posted this on a couple of Lego Stop Motion Forums and it was well received so, I thought I would post it here for your reading pleasure :) Enjoy laughing at my expense :P This version includes three updates so it is rather long. Without reading a tutorial or watching any how to videos I set about upon my quest to do something entirely different in stop motion. My first attempt was to simply do a small snippet of myself in minifig form (a very similar likeness when I put on a generous application of spray on tan) saying "Hello" in my near to perfect Rowan Akinson voice. "WOW! That was awesome!" I said to myself. I am so going to be the next George Lucas of the Stop Motion world... oh yeah... the never-to-be-seen-again Prequels... Never mind that, I made a MY minifig move and talk! Oh... What is that annoying light flickering and why does the plate keep moving around? There should be no light flicker. I have full Studio lighting, a pretty good DSLR camera and no external light source. So I guess for my next movie I will need to edit each frame for white balance. Hours after searching for a good free, non-pirated, editing software I came across GIMP. It was perfect for my needs! As for the plate, I shall use my secret weapon, the super stickified sticky tack! Oh and the sound was far too low, easy fix for that, crack the volume on my headset mic. Done and done, ready for my next adventure in the world of Brick film! A good friend asked me to do a video with my minifig, who I named LegoDad, doing my My Bean impression. "Why not? I am genius at this now!" Don't you agree? Okay, maybe not genius... but see the sound of footprints is ALMOST lined up with his actual foot prints. And there is only one bad flicker of a shift in white balance. I spent a long time editing each frame, step by step changing the brightness and contrast of each and applying colour balance! A true masterpiece I tell you, all that work will be worth it when I wiln my... wait, do they give Oscars out for Brick films? The head bobs and quickly twisted head motions may need a bit of refinement, just a touch. Oh, that missed step... guess I missed that frame in my editing. The plate was a particularly brilliant idea to get the minifig to move on a flat surface if I do say so myself. A truly amazing improvement over that first "novice" film! I am ready for the big time now! Stay tuned (probably the next time I get bored in the middle of editing) for my continuing adventure into unknown nether regions of Stop Motion where I put my very first Public video on Youtube! Yup, you guessed it, I am stop motioned out for the day. Time to write of my glamorous exploits so you can live vicariously through me. Approximately, two arduous weeks ago I decided it was time to post my first official Youtube video. Little did I know what I was delving into. My first video is best described as a hot steaming pile of... PURE AWESOMENESS!!! I simply don't know how to describe in words the utter perfection you will witness in this video. You will just have to see it for yourself. Okay, so perfect might be too strong a word. But c'mon there is a explosion in it! Every good stop motion should include an explosion, right? Yes, the camera was too far away from the action, and yes, it is a bit jumbled. There should be a warning label attached because the strobe light effect from the multiple light flickers might cause a seizure in small children. The over saturated colours could cause temporary blindness. And the constant out of focus frames would drive even a far sighted person, without their glasses on, to shudder in revulsion. But, besides all that, perfection! I DID manage to get the voices in on the right cues, using Audacity. Honestly, the voices are my favourite bit. Disney really should give me a call, I could give them a few pointers. Strike it up to lessons learned and move on to my next great achievement! It was time to try my new found skills to put together a whole video, with a stop motion segment, and a quick build review segment. Also, at this time, I filmed the intro and extro. Now I don't want to set your hopes up but this, ladies and gentlemen, is truly something which must be seen to be believed! DID YOU SEE THAT!!! Oh... you only got through half of it and fell asleep... Yeah, most of the kids who watched it did the same. So I have to rethink the video segment, no worries I got a plan! But hey, look almost no light flicker! Woot, score that one up to a win! Believe it or not, and I know it is hard to believe, but I, me, I did all the sound effects! Yes, sirry, you should be impressed! Stop looking at me like I am little child who just tried to draw their dog and managed somehow to create a passing imitation of a Picasso painting. It's not THAT bad...well..sniff.. it isn't, is it? Yeah, yeah, I am going to go away now, but I will be back and better! You wait and see! Time for another installment of the hit series "What to do when you are bored and want to read the inane ramblings of a mediocre-at-best stop motion animator"
The great burden of responsibility fell upon me to provide quality a quality video for all of my six Youtube subscribers (My wife and my other Youtube account not withstanding) last week and that is exactly what I set out to do! You are fortunate enough to be able to see before a work of true... hmm, Vision? No. Artistry? Not really. Splendor? Most definitely not! Shi... Don't say that kids could be reading this! Dear reader I shall let you decide. I can tell by your stunned silence that you are at a loss for words. I shall take your awestruck expression with the greatest of humility. I know it is not everyday you see a video of that calibre. That special effect with the ever changing colour balance in the intro took some doing, hours of painstaking editing went into making sure each was just a little bit off from the one before. Look at how smooth LegoDad moves! Notice how you can hardly tell where I repeated the loops for his headshake and emphathic gestures. Oh, you did notice... Well NOW you see it because I just pointed it out, obviously! An look how his hair moves so naturally as he moves his head, it is almost like it is actually real. Can you imagine the work that went into that effect! Did you hear the music? That is called production value! Only the best for people watching my videos, I do after all have subscribers to please. Easing??? That's what I do on Friday night with a few pints of Guinness. How the heck does that apply to brickfilming? Unless, you mean, it helps to be slightly inebriated when filming or watching this stuff. That makes sense, I mean the blurred vision would be useful in blending the images together, just like a mask for photo editing. That makes total sense, thanks for clearing that up! Ease in. Ease out. Ohhh, now I get it. Speed up the frame rate as I get to the apex of the action then slow it down at the end! Got it! No? But... argh, that should work in theory right? Okay, okay, that doesn't work. Well then, what about adding in extra frames to blur the action? That sounds all technical, so it should blend the whole sequence together, just like those Guinness I mentioned before. Oh.. they needs to be high speed so you don't actually see the blurred part hmmm.... might need to work on this easing stuff a bit more. And what a flawless explosion! You could just feel the concussive blast waves coming off that one couldn't you. So fluid how the pay loader fell apart like that, exactly how it look like in real life. Rushed you say! My Guinness had just settled out, of course I was rushed to finish. I had some easing to do. The subtle smooth panning seamlessly followed every movement on the screen with no distraction added at all, you could hardly even tell that you were looking through a camera lense. Such a marvel of filmography! I really don't know how I could improve on that. Oh, yes, I am sure you do! The sweet lovely tones of the pay loader driver's voice took me hours to perfect. Sadly, no, that wasn't a joke... Her grating voice was a result of mixing a terrible Miss Piggy impression with and equally horrendous Southern US accent. Wrap that up to a stereotypical country bumpkin persona and you have sheer genius! I will be hard to top that level of stop motion excellence. I have taken over a week to film my next video and I am not even close to complete yet. Maybe, just maybe, I will be able to do better. You will just have to wait and see! Hint, hint, do what the little man says at the end of the video so you don't miss an genre altering videos ;) Of course, you could always wait until I post again, but where is the fun in that! Between now and then my Guinness and I have a lot of easing to do. Very nice! And quite smooth. Can imagine how long it took to create each video. Want to create my own stop motion vids, but looks supremely time consuming. Any tips for beginners? I am only a beginner myself but, I can offer what few bits of knowledge I have gleaned so far. Good lighting is a key. Make sure you film in a space where no light can enter accept the light you put on the scene. Take LOTS of pictures, if you think you have enough take twice as many. You can always delete unwanted frames later, but it is hard to go back and reset a scene after the fact, if you want to add pictures. Figure out the manual settings on your camera, if you have a high end camera, it will save you hours of editing. Get close to the action, most of my videos, excluding the one I am filming now are too far away from what is going on. This can muddle the video and makes it hard for people to follow. Have fun! This is a fun genre to work in, it can be frustrating at times, but keep reminding yourself it is all in good fun. When you catch yourself laughing hysterically at a 3 seconds clip you just filmed that took you an hour to complete will understand what I mean. I don't mind stop animations that aren't film studio quality if the are entertaining, it's often part of their charm. For me the single biggest problem with yours is the LEGO camouflage background. Thanks for the feedback Scrumper. Some other people have said as much to me as well. My current video project is being filmed on it, but after that I will looking into a blue/green screen. Thanks for the advice. Are you using GIMP to put all the pictures together to have it as smooth video? Also, how many pictures do you take to make a 1-minute film for example? I agree with scrumper, the Lego camouflage background is distracting. Change that and your films will be top notch! I use GIMP for editing, Davinci Resolve for colour matching, Audacity for sound mixing and Window Movie Maker for bringing it all together. The latest video I just finished up filming was just under 1000 frames and that spans just shy of 90 secs. I think it came out pretty smooth although there are still some rushed sequences that should have been fleshed out more IMO. A good rule of thumb is 10 to 15 frames per second of video. Yup, general consensus is to loose the Lego backdrop for filming. I have to find a suitable green/blue screen replacement which I will be doing this week. with the camera you are using are you assigning your camera's white balance, and ISO, aperture, and shutter speeds? if you start with a few shots on a white background you can dial in the colors you want, once you have those since your target is not moving nor is lighting in the room changing, you can lock in so that the camera doesn't adjust it for you based on changes in your target objects color changes. you may be able to eliminate the need for post processing on lighting for most frames. Keep in mind that a green/blue screen needs to be evenly lit, it'll make editing pictures in GIMP (or any other graphics editor) easier. A uniform background is easier to cut and replace. Green/blue/any colour background might reflect onto your minifigures and bricks, Lego is made of shiny plastic after all. Unwanted reflections need to be edited out. 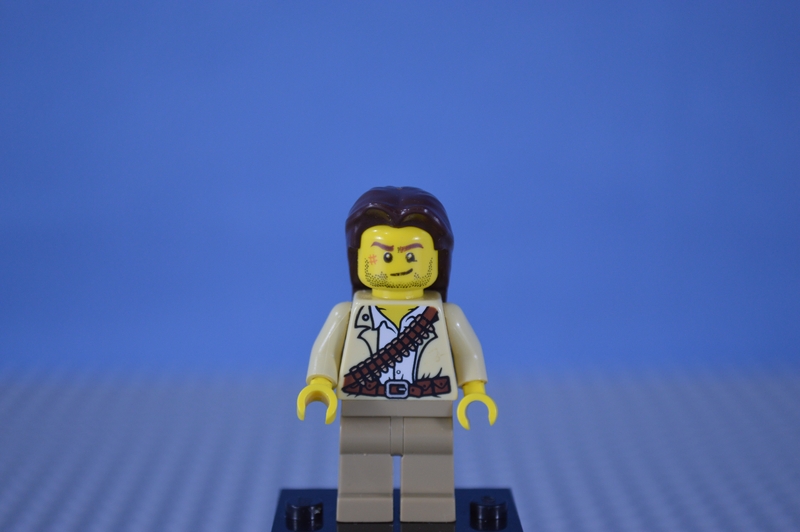 Because I'm still learning to animate my minifigs and scenes I haven't bothered too much with chroma keying yet. I decided to keep that kind of editing for a later stage, so for now I just work with an infinite white background. That allows me to focus on building scenes and animating. There are several ways to get an infinite white effect, I went for overexposing a (curved) white sheet of paper. Basically I made sure that my background is lit much brighter than the rest of my scene. What this means in practice is that digiCamControl displays the previous picture I took on a transparant layer over the live view of the camera. This allows me to compare pictures and see what kind of movement I need to put in every shot. Onion skinning is available in a lot of tethered shooting software, I don't know if GIMP offers this kind of function though. with the camera you are using are you assigning your camera's white balance, and ISO, aperture, and shutter speeds? I just began to experiment with using my manual settings, it made an amazing difference it my processing speed not having to worry about my lighting after the fact. Currently my filming box is all painted out white. I used to do miniature photography and did it on the backdrop of a light blue sheet which worked very well. I may try that. A fabric sheet generally gives off much less reflection that say a smooth piece of Bristol board or similarly textured sheet material. It may not work so well with Stop Motion but I will give it a go. Welcome back to continuing saga of "The Man who was One Stud Shy of a Full Brick"
It may be hard for you to believe that I could top the masterpieces I have put out for public consumption before but, I may have succeeded in doing the impossible! So I know what your thinking. How rude of me to cut that guy off at the beginning. Listen, that guy just won't shut up! Put him in front of the camera and he goes on and on! You have to put a stop to it at some point, you should have heard how long he went on after I turn off the camera. HOURS I tell you! Fingerprints on the windshield? No, no, that was just some streaks of water left after Chief drove through a mud puddle. I think the people of New York City would be honoured to have me putting their little city on the map by me doing an impeccable imitation of their local accent. I am expecting the Keys to the city to arrive in the mail any day now. It literally took me hours to get Jack to understand how to use that saw so expertly he could cut away the hook from the wrecking ball without damaging either! That was a feat I don't think could be repeated. I think it must have messed up his back a bit because he seemed a bit out of step when he put the saw down and grabbed the hook. Notice how still that truck was when Jack was moving around the bucket. I don't know how he was moving around a huge vehicle like that, I think there is more to Jack than meets the eye. I mean did you see him hold himself on that hook with ONE HAND! Look how smooth the bucket of the pay loader approached the front of the dump truck, that was some serious movie magic. Now you may ask yourself, "How does a small pay loader and a crane lift a dump truck and move it with such ease?" "Science," I say, "basic physics really, I mean c'mon..."
Brenda needs new brakes, they are awfully squeaky. We made Chief clean the cab of the truck out later. Do you know what it looks like after a Mini fig gets sick??? You don't want to, trust me. I went out and actually spent days following around a work crew just to find the perfect sound for when a cable get released when under tension "Peewwown" was it exactly. Now I don't know if a crane would flip over so elegantly like that in real life. I took a lot of precautions to make sure the cab wouldn't be crushed on Sal, so I took a few liberties with that shot. There we have it, another Stop Motion video par excellence. In a couple days time I hope to have the build part of the crane posted. It will be full Stop Motion as well. I went an found a suitable backdrop for my studio and changed the floor to grey and green base plates. Here is a picture of the resulting photo test. I will have to calibrate my camera for this set up but that is no big deal. I can see some light reflecting on your minifigure. Perhaps you could consider diffusing the light by taping some (baking) paper over your lights? I have one layer on them already. I may have to find a thicker material. I have full strength studio lighting (150w) so I may have to consider smaller bulbs as well.